It’s important to keep your drains clean and blockage free. With your own machine, it’s a simple process. Keeping your drains clean is an important part of household maintenance. After all, it will help to prevent any problems in the future – and could save you quite a bit of cash too. So it’s a good idea to invest in a drain cleaning machine. By doing so, you will be able to clean your drains at a time that’s convenient for you, as well as being able to spot any issues before they develop. So what are some of the best drain cleaners on the market right now? RIDGID is a massive name in the drain cleaning industry; in fact, the company is the number one supplier of tools in the world. They’ve achieved this by using top quality materials and innovative methods to make their products. So if you’re looking for a RIDGID drain cleaner, then what one should you go for? Well, the K-60 SE is an invaluable piece of kit, coming with everything you need to give your drains a thorough clear-out. Rothenberger have been in business for over 60 years, and market themselves as the preferred partner of professional users. With more than 5,000 products in their arsenal, they offer some of the greatest variety on the market. For a home owner wanting to clean their drains, there are quite a few choices. Possibly the best though is the R600 drain cleaning machine. Lightweight, compact and easy to use, it’s perfect for beginners. 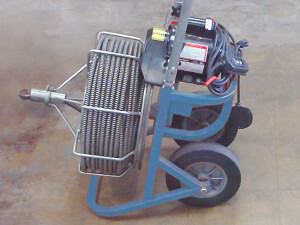 General Wire are one of the most trusted names when it comes to drain cleaning, and have been providing British consumers with quality equipment for many years. They use durable materials such as reinforced steel drums and Flexicore® wire rope cables to ensure that their machines stand up to the toughest of tasks. Their best offering is the Speedrooter 92, which as well as being incredibly easy to use, has been designed to make it easier for you to load it onto a vehicle. You’ll be able to find these machines and many others by their respective companies online – there are websites entirely dedicated to drain cleaning equipment out there. You’ll be able to ask for advice on which one to buy, and you can compare different brands and products side by side. Each home and business is different, and you’ll need to think carefully about which drain cleaning machine is right for you. Of course, there are some situations in which it’s best to call in the professionals. If you’ve tried cleaning your drains without success, or are a little apprehensive about trying it, then it may be an idea to step back and let someone else take care of the problem. We offer comprehensive drain jetting services, and have some of the best equipment in the industry at our disposal. We’ll get the job done quickly and efficiently so that you can get back to normal as quickly as possible. You’ll be preventing many problems from occurring, and you’ll save yourself a lot of money in the long run. Whether you take care of that maintenance yourself or hire someone else to oversee it is something that you’ll need to decide for yourself. One thing is for sure though – your home will certainly thank you for it!